Low tech farming or small-holding doesn't use expensive chemicals where free alternatives exist. In Galicia this is particularly true with most farms still being small and family run like my next door neighbours. 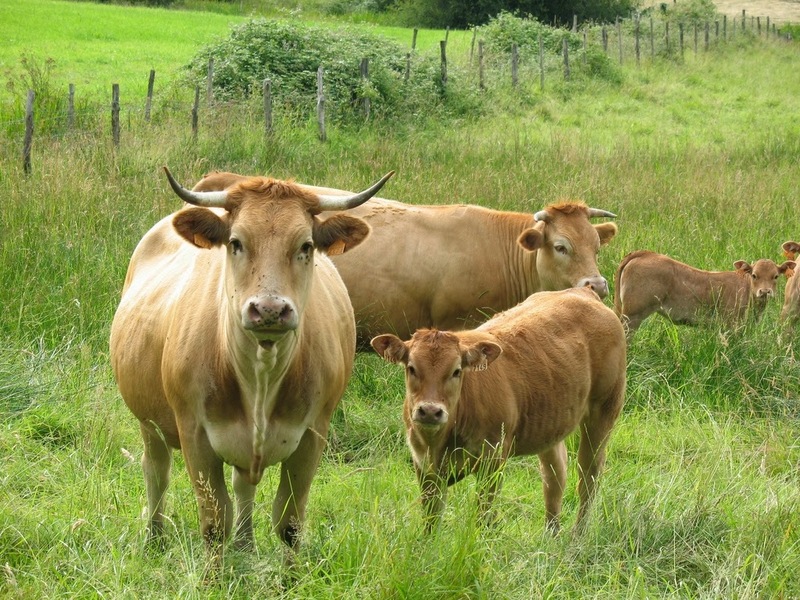 Their main product is veal from the traditional Rubia Gallega breed, a high quality product covered by the European Protected Designation of Origin - PDO. The cows all graze outside all year round on unimproved permanent pasture, they also have a very small dairy herd, goats, pigs, chickens and grow their own hay. They also grow fodder crops and vegetables for themselves. They pump out the slurry tanks under the barns and spray it on their fields before growing hay. They throw their vegetable waste onto the vegetable patch over winter before ploughing it in, in Spring. Soiled bedding is neatly stacked and left to age. Nothing is wasted. Yesterday they were preparing the vegetable growing area and adding some wonderful aged manure to the soil. I asked nicely for some and they were kind enough to set some aside for me. I will add most of it to the soil in my new poly-tunnel when it arrives and the rest to the squash growing sites. Although I have chicken manure and compost my own waste, there is never enough of it to go round. Aged manure really is black gold and is valued accordingly. After a warm couple of weeks the recent weather has mostly consisted of grey cold days with a biting Northerly wind. Leaves are slowly emerging and occasional blossom can be seen but it has all been a bit slow. Recently whilst gardening I occasionally caught an unidentified flowery scent which I couldn't pinpoint. Yesterday all was revealed, it is the Cornelian Cherry in the forest garden, looking beautiful and smelling divine, an absolute magnet for small flying insects. It needs to be because at this time of year there isn't much insect life about. Luckily the flowering dead nettles offer another snack to those hardy flying insects and one brave outdoor geranium is trying to flower. I can't wait for more warm weather so that I too can blossom instead of hunching over the fire. Hope you´re weather warms up soon! Thanks, I think rural Galicians still value the important things in life, such as good wine, food, company, singing, firewood and manure.